This program is designed specifically for young dance students six years of age and older who want to take the next step in their dance training. Summer Dance begins on June 17 and continues through August 17. To register, simply click on the name of the class and follow the registration instructions. Registration is Now Open for all! Are you ready to enroll? Take a look at the tuition calculator (link below) to understand your costs for summer dance. The cost of a 1-hour class is $16. For instance, if you enroll in four one-hour classes each month, your total would be $64. Tuition is calculated separately for each dancer during the summer. Please see our tuition calculator below for more information. WHAT SHOULD MY DANCER WEAR TO SUMMER CLASSES? We know that many new students often join us during the summer! That's why our dress code is more relaxed during the summer. Students may choose to wear their class leotard, if they are a returning dancer, or a leotard of their choice. All female dance students will need pink ballet slippers and tights as well. Boys should select black leggings (or form fitting black pants) and a white form-fitting shirt. More information on our year-round dress code can be found by clicking here. ​If you have never shopped for ballet flats (slippers) before, please visit a dance store to ensure your student has the best brand/style for their feet. Many of our families enjoy shopping with Dance Supplies, Etc. in Severna Park, MD and at Footlights (various locations throughout MD and VA). Hair must be in a bun for all classes. Hair must be pulled back from the face in a bun. If your dancer's hair is extremely short, a french twist or clip is fine. We require this to ensure that hair does not distract dancers while they are in class. This year, current students will be placed in summer classes according to the level they took during the 2018-2019 school year. Please review the placement guide below. LEVEL A - If your child is between 3 - 5 years old, select level A. LEVEL B - If your child is a new/beginning dancer (or currently in level Ballet 1 or 2 ) who is ages 6 - 8, select level B classes. LEVEL B+ - If your child is a new/beginning dancer (or currently in level Ballet 1 or 2) who is ages 9 or older, select level B+ classes. ARE YOU COMING TO US FROM ANOTHER STUDIO? As we're located in a military community, we know that dancers often relocate to Southern Maryland from other areas. If you have previous dance experience and would like to continue your training, we would love the opportunity to meet you! Please contact us for a FREE evaluation class. Our teachers will watch you carefully during class and let you and your family know immediately afterward which classes will be the best fit for you. All of our dancers are covered by the studio's insurance policy. To place you on the policy for one day, we will need your first and last name, birth date, and a phone number. We look forward to meeting you! You may request a evaluation by connecting with us here. MY CHILD HAS NEVER DANCED BEFORE. WHICH CLASS DO I SELECT? Ballet Caliente offers beginning classes for children of all ages. After reviewing the chart below, please let us know if you have any questions by emailing us at info@balletcaliente.com. We offer a warm, comfortable environment for those just beginning! WHAT HAPPENS AT THE END OF SUMMER IF I'D LIKE TO CONTINUE? We would love to have you continue with us during our year-round program, which begins in early September. In late July, you will receive a placement letter using the email address you provide. Registration for our fall classes will open the first week of August. To learn more about our year-round program, please click here. Please note that "A" and "B" under each day refer to the studio in which classes will held. ​A 30-minute class on Mondays for students aged 2 to 3 years and Mommy (or Grandma!). This class does a wonderful job preparing children for pre-ballet, introducing them to the arts and providing some quality family time. Students must be able to use the restroom independently. ​Meets for 45 minutes, once per week. Ballet A is designed to introduce our youngest dancers to dance concepts including terminology, movements and musicality in a fun and safe environment. Using imaginative play and games, students develops skills such as core strength, balance, and flexibility. NEW STUDENTS AGES 6 - 8 - or current Ballet 1 and Ballet 2 students who are 6 - 8 years old. Ballet B introduces ballet movements, terminology, and combinations; including barre and center work to new students as well as challenge returning students with more difficult combinations. Ballet B is a one-hour technique class that meets two times per week. Students in Ballet B have the option to enroll in Jazz B or Tap B to expand their dance horizons. NEW B+ CLASS FOR AGES 9 and OLDER! NEW STUDENTS AGES 9 OR OLDER - or current Ballet 1 and Ballet 2 students who are 9 and older. Ballet B+ introduces ballet movements, terminology, and combinations; including barre and center work to new students. Ballet B+ is a one-hour technique class that meets two times per week. Students in Ballet B+ have the option to enroll in Jazz B or Tap B to expand their dance horizons. Ballet C introduces more advanced dance concepts and combinations for the intermediate level dancer. Ballet C includes a two hour technique class that meets four times per week and a Pre-Pointe/Pointe class. Students in Ballet C have the option to add Jazz C, Contemporary C, and/or Tap C/D to expand their dance horizons and/or Intermediate/Open Technique, and/or yoga/Pilates to focus on technique and increase flexibility, stamina, and core body strength. New students by placement or current Ballet 5, Studio Prep & Studio Company. Ballet D is designed to increase the stamina, strength and versatility of the advanced dancer. Ballet D includes a two hour technique class that meets five days per week and a Pointe class. Students enrolled in Ballet D have the option to add Variations*, Jazz D*, Contemporary D*, Tap D/C,* and/or yoga/Pilates D/C*. *These classes are mandatory for Studio Company & Studio Prep dancers. Teaches terminology, steps and combinations used in Tap. Tap is a one-hour class that meets one time per week. Teaches movements and terminology used in jazz and meets one time per week. 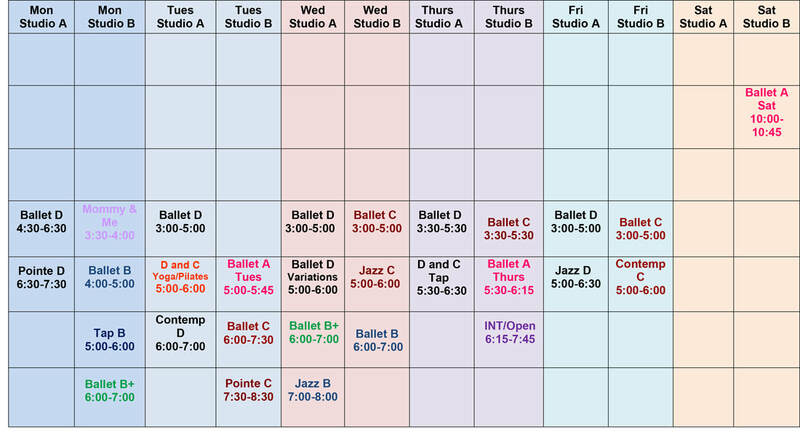 Jazz B is a 45 minute classes, Jazz C meets for one hour, and Jazz D is a one and a half hour class. Teaches movements and terminology used in contemporary and modern - Horton, Graham, and Limon styles. Contemporary is a one hour class that meets one time per week. An intermediate technique class for those students enrolled in Ballet C or new students thirteen and older. Intermediate level adults are also welcome to enroll for increased focus on basic technique. ADULT STUDENTS MUST PURCHASE A PUNCH PASS. Students learn proper technique at the barre and work to develop flexibility, balance and core body strength. INT/Open Technique is a one and a half hour class that meets one time per week. Available to students enrolled in Ballet C or D. All adults welcome. ADULT STUDENTS MUST PURCHASE A PUNCH PASS. Suitable for all yoga and Pilates levels. Yoga/Pilates aims at building muscle strength and re-balancing the body as well as improving posture, flexibility, coordination, concentration, and control of the body. This class alternates weekly between yoga and Pilates. Yoga and Pilates are each a one hour class. Punch passes may be used by adults for INT/Open Technique, or yoga/Pilates classes. Current students may also use punch passes to supplement their summer registration. PASSES EXPIRE AT THE END OF THE SUMMER SESSION REGARDLESS OF WHEN PURCHASED. The Ballet Caliente Summer Intensive guides students in their ballet technical skills as well as other dance forms that compliment a ballet artist. The program is held from 9 a.m. - 3 p.m. at Ballet Caliente's beautiful studio in California, Maryland. Unlike big company intensives, our summer students are exposed to exceptional individual attention and corrections. This program offers unparalleled training by a distinguished staff of Ballet Caliente instructors and well-known in-state and out-of-state guest teachers. ​COST: $400 for one week or $750 for both. Encouraged for students enrolled in Ballet C or by invitation. Encouraged for students enrolled in Ballet D.